A frog terrarium can be as simple or complex as you want it to be. You can buy most of the terrarium elements from a pet supplier, or you can make some of them yourself. Once you understand your tropical frog's basic needs you can decide how you'll go about providing for them. A vertical terrarium is best for poison dart frogs because they're arboreal animals. A glass terrarium does a better job of keeping in the warmth and moisture these frogs need than a plastic one. A tight-fitting, escape-proof hood with a built-in light keeps frogs safe and helps retain moisture. Many frog terrariums have false bottoms to make for easy cleaning. The false bottom should have a hole for drainage connected to a tube leading to a collection bucket. The space under the false bottom often has doors at the front for access, allowing for easy clean-up. When rinsing the tank for cleaning the excess water drains into the tube and collection bucket. Specially-designed reptile terrariums with hinged doors at the front also allow for easier cleaning. 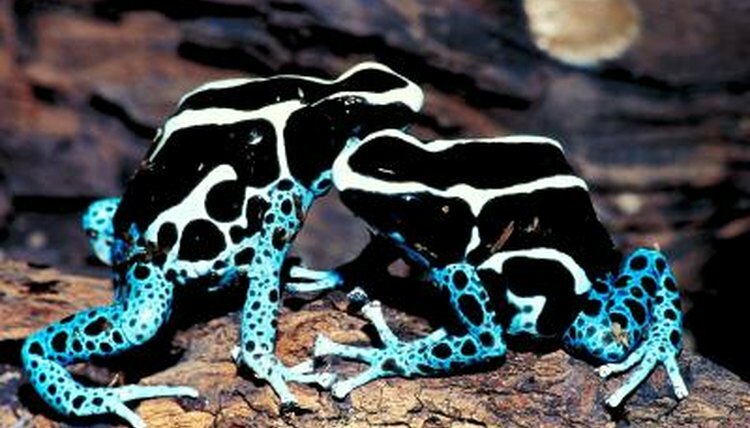 A UVB full-spectrum fluorescent light is recommended for poison dart frogs. If your vivarium receives no indirect natural sunlight, the light should be cycled 12 hours of light and 12 hours of darkness per day. If your vivarium receives indirect natural sunlight, only use the light for 2 to 4 hours per day. Vivariums should not be placed in direct sunlight because this can cause the tank to overheat. Poison dart frogs like daytime temperatures of 72 to 80 degrees Fahrenheit. Temperature in your vivarium should never exceed 84 degrees. Poison dart frogs need humidity levels between 80 and 100 percent. You can achieve this by providing a fog machine and/or a waterfall. The fog machine can be placed in the tank and housed securely so the frog can't access it, or set up outside the vivarium with the fog pumped in via a tube. If fungus develops in your vivarium, decrease the humidity until the problem clears up. Your frog will also need a shallow pool of water, which can either be a simple bowl that's changed regularly, or a full waterfall installation. A hydrometer helps with monitoring moisture levels in the vivarium. Plants like ferns, bromeliads, orchids, heliconia and mosses can all make great plants in a poison dart terrarium. Ferns have no roots and can be planted in just about any substrate, but rooting plants will require a layer of gravel topped with a layer of pesticide- and fertilizer-free soil. Plants won't need to be watered often because the vivarium humidity is high, so just a misting with purified water is enough if they look thirsty. Because poison dart frogs are arboreal they'll want things to climb on. You can purchase pet-safe logs, branches and rocks from pet stores. Log diameters should be big enough that your frog can easily walk through them and rocks should be smooth. You can get really creative decorating your frog's space with the terrarium backing. You can purchase premade backings from pet stores or make your own with cork board or clay. Three-dimensional walls can be planted and sculpted so your frog can climb on them. Plants like monstera and philodendron can be planted on a sculpted back wall. If paper or plastic printed decorative backings are used they should be attached outside the tank.